The webinar, featuring J.P. Gownder, our guest speaker from Forrester, will discuss how AI and automation are enabling enterprises to drive innovation, increase productivity and enhance customer experience while fundamentally transforming the nature of human work. Join us to find out how Digital Workers will impact every business function, in every industry worldwide. * Key trends that are shaping the future of work. * The changing landscape of modern workforce. * The new Digital Worker for the age of AI and automation. Artificial Intelligence, robotics and automation are creating a seismic shift in the way businesses and societies function, and are redefining the way humans work. In this webinar, Darrell West, Vice President at the Brookings Institution and author of "The Future of Work: Robots, AI and Automation", joins Neeti Shukla, Co-founder and Senior Vice President, and Max Mancini, Executive Vice President of Marketplace and Ecosystem at Automation Anywhere, to discuss the social, political and economic implications of the changing work paradigm. Join this expert panel as they discuss the dynamics of human and digital worker collaboration. * The future of work, and implications for businesses, workers and societies. * The role of digital workers in a new era of productivity and innovation. * How businesses and workers can be competitive in the new digital economy. Organizations have a lot riding on the efficiency and effectiveness of their procure-to-pay processes. Yet, most organizations rely on manual or semi-automated procure-to-pay processes. A big part of the blame can be pinned on the approach that most organizations have taken to automating procure-to-pay. Another contributor is the exploding volume of untapped structured and unstructured data from documents such as invoices. Robotic process automation (RPA) with cognitive automation takes procure-to-pay to the next level. Join us for this webinar and learn how. Our speakers will discuss the challenges with traditional approaches to business process automation, provide an overview of RPA and Cognitive Automation, and lay out the benefits of RPA in procure-to-pay. Our industry faces increasing pressure to deliver operational efficiencies across business functions as traditional costs are becoming less effective. Cognitive automation, as a game changer for biotech, has created a lot of hype. Where are the real results? Identify how the latest in cognitive automation trends can be combined with Life Science’s intelligent operations to deliver measurable results within months. Leading pharma, medical device and instrumentation companies such Becton Dickenson, AstraZeneca and Boston Scientific, have transformed their processes to achieve unparalleled results with RPA and cognitive automation platforms across the enterprise. The 3 Ps of RPA adoption – Platform, Partner, and Process. 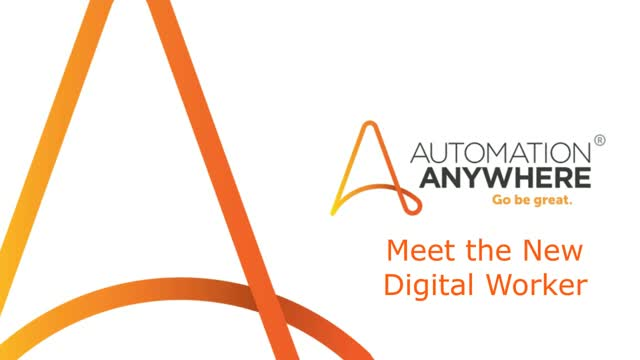 Join us to hear about Symantec's RPA journey with details on their ROI as well as the strategic value to their business using the Automation Anywhere platform. We will also hear from our partner August Consulting about how their framework for RPA adoption and domain expertise helps customers accomplish their goals. Through Symantec's experience, you will learn how to successfully evolve from task-based automation to role-based automation and what's new with deploying a Digital Workforce today. Organizations learn the hard way how slow and inefficient order-to-cash processes can affect their ability to grow. Errors in order processing increase costs, result in write-offs, and frustrate customers and stakeholders. And delays in processing orders can result in missing top-line revenue targets. Improving the timeliness and accuracy of order processing through automation is a no-brainer. But what’s not so clear is which approach to automation to take. During this webinar, our speakers will cut through the noise and show you how emerging technologies such as robotic process automation (RPA) and cognitive automation deliver processing intelligence that provides order-to-cash professionals with speed and accuracy that simple programmed rules could never hope to achieve. Today, many complex business processes involve unstructured data and cognitive decision making. In this webinar, we'll explore how AI and robotics process automation (RPA) can help automate such processes by leveraging AI to bring structure to unstructured data and automated machine learning models to make intelligent decision. Over 25% of Financial Services business processes are likely to be automated in the next few years. Robotic Process Automation (RPA) is a critical tool to help your organization automate manual repetitive activities, access unstructured data, and quickly deliver error-free results. Join us live as Automation Anywhere, the leading provider of RPA and cognitive intelligence solutions, offers insights on how Financial Services companies have successfully implemented RPA. Analyst firm Everest Group studied over 50 RPA deployments and found that the enterprises with the most impressive results shared certain common characteristics. Research Vice President Sarah Burnett will join us to discuss how these "Pinnacle Enterprises" achieved 4x the ROI and 3x the added resource capacity. Artificial Intelligence, robotics and automation are creating a seismic shift in the way businesses and societies function, and are redefining the way humans work. In this webinar, Darrell West, Vice President at the Brookings Institution and author of "The Future of Work: Robots, AI and Automation", joins Neeti Shukla, Co-founder, and Senior Vice President, and Max Mancini, Executive Vice President of Marketplace and Ecosystem at Automation Anywhere, to discuss the social, political and economic implications of the changing work paradigm. - The future of work, and implications for businesses, workers, and societies. - The role of digital workers in a new era of productivity and innovation. - How businesses and workers can be competitive in the new digital economy. Automating accounting has been one of the most critical IT projects within many organizations. Disparate and disconnected systems often require manual cross-checks. Robotic Process Automation (RPA) introduces a different approach to automation where business users, such as accounting managers, are empowered to drive automation of repetitive tasks, while IT implements controls, governance, and enterprise-grade security, required by the organization. Watch this webcast to learn how today's manual accounts payable process can be automated through the use of a digital workforce. Stop spending countless hours manually comparing POs against quotes and invoices. During this webcast, learn how to automate your manual processes using IQ Bot. IQ Bot is the only cognitive bot that leverages computer vision and machine learning to automate document-centric processes, end-to-end. The ease of use and rapid ROI have made RPA a cornerstone of digital transformation. However, 80% of enterprise data is “Dark Data” –information that is difficult to extract using RPA alone. Cognitive platforms can bring structure to unstructured data but are hampered by high costs and long deployment cycles. Watch this webcast to learn how purpose-built cognitive automation solutions can bridge this vast RPA and cognitive platform divide.